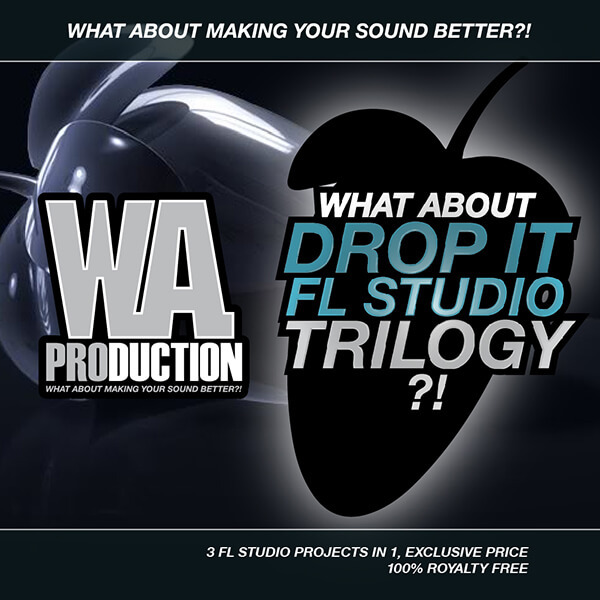 ‘What About: Drop It FL Studio Trilogy‘ brings you a 3-in-1 compilation of three exclusive EDM/Progressive FL Studio projects from W. A. Production. These templates contain everything that modern producers need to know and need to have to create new and awesome tunes. You’ll find 31 exclusive Sylenth presets, and three Massive presets together with vocals, FX and drums. All 100% Royalty-Free. Inside these FLPs you will find how the W. A. Production team uses compressors, maximus, equalizers, limiters, delays, reverbs, wave shapers, stereo effects, distortions, and much more. ‘What About: Drop It FL Studio Template’ is an awesome EDM/Progressive FL Studio project from W. A. Production. Inside you’ll find nine exclusive Sylenth presets, one full length FX line and other FX samples, tuned big room kicks,melody ideas, synths modulations and variations, compressors, equalisers, stereo effects, and more. This template was inspired by famous proucers such as Blasterjaxx, Alvaro, and Martin Garrix. ‘What About: Drop It FL Studio Template 2’ is the second FL Studio project from W. A. Production for all EDM/Progressive FL Studio users and producers. In this template you will find 11 Sylenth1 exclusive presets and three huge Massive VSTi Sounds, as well as a nice collection of drums and FX samples. This project contains everything that modern producers need to know and have to create new banging EDM anthems. This template was inspired by the most famous producers, such as DVBBS, Twoloud, Alvaro and Blasterjaxx. ‘What About: Drop It FL Studio Template 3’ is an exclusive EDM/Progressive FL Studio project from W.A. Production. This template contains everything that modern producers need to know and need to have to create new and awesome tunes including 10 exclusive Sylenth1 presets, drum samples, FX samples, vocal samples, and much more. This template was inspired by famous producers such as Showtek, David Guetta, R3hab, Deorro. ‘What About: Drop It FL Studio Templete 3’ includes a lot of great ideas for making Big Room bangers and will show you how to utilize maximisers, compressors, equalisers, reverbs, delays, stereo effects and distortion.